Hamburgers usually make for a great meal, though they can get stale as a food option if you do not make an occasional effort to change things up. Over the weekend I decided to prepare cheddar melt burgers on rye. Cheddar melt burgers are fairly fun to prepare, if only because they do not require as much effort as exotic burgers. Prep your ground beef as you usually would, slice some cheddar cheese and red onion, then pretend you are making grilled cheese with a burger in there. Ground beef (Dakota Beef organic). Cheddar cheese (1-year aged Vermont white). Prep ground beef into relatively thin patties. You may want to mix some spices and Worcestershire sauce into the ground beef. Cook patties as you normally would. 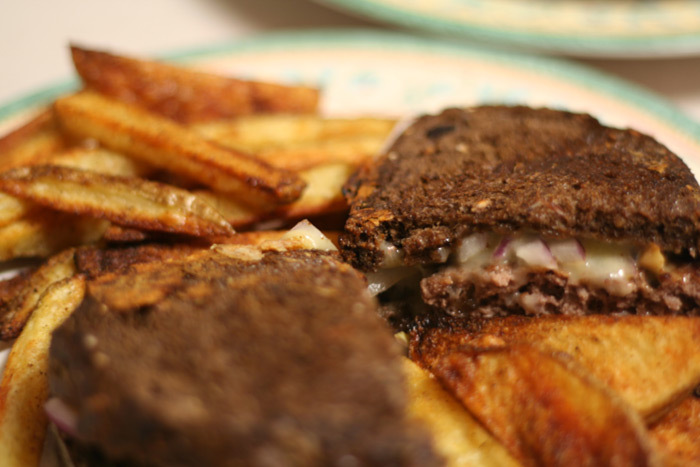 Remove cooked patties from pan and replace with slices of rye bread (however many you mean to serve. Place one layer of sliced or shredded cheddar cheese on the rye bread, spread on some onion, and place cooked hamburger patties on top of this. Let this cook for a minute so the cheese can begin melting, then place more onion, cheddar cheese, and the second slice of rye bread on top to complete the cheddar melt. Flip (be careful here) and allow other side to melt. That is it. Your cheddar melt should be ready to go. This burger is a bit higher in fat content than usual (thanks to the extra cheese), so consider using a healthier side dish. A light salad would be nice, or perhaps some avocado oil potato chips. In this case the cheddar melt was served with seasoned baked potato wedges.